The Bangla blogosphere and Bangladeshi Facebook users are angry and protesting the accusation that ‘Avro ‘, a popular and widely used freeware Bangla input system, is a pirated version of a popular commercial Bangla input system called ‘Bijoy ‘ and that the Avro team have been called hackers. In an article  in a Bangla news daily, Mustafa Jabbar, the proprietor of Bijoy and a pioneer of Bangla computing said hackers were responsible for spreading pirated copies of his Bijoy software on the internet. He also said that UNDP had helped these hackers to be selected by the Bangladesh Election commission for their national database works. It may be mentioned here that Bangladesh saw more than 20 proprietary Bangla input software products between 1984 and 2002  and the most popular of them was Mustafa Jabbar's Bijoy during that period. Many developers worked on its various versions. Despite this, the real boost in Bangla computing came when in 2003 Mehdi Hasan Khan , a Bangladeshi medical student, developed Avro  using the Unicode  standard. Avro is a closed-source but free graphic keyboard layout changer, and was further developed during the last six years by Mehdi and his friends Rifatunnabi, Tanvin Islam Siam, Ryan Kamal, Shabab Mustafa and Nipun Haq. Bijoy is a ASCII based, proprietary Bangla input system software and requires the purchase of a license to use. Avro on the other hand is a Unicode-based freeware which offers four different input systems with four keyboard layouts – Avro Phonetic, Bornona, National (Jatiyo) and UniBijoy. The Avro phonetic (or transliteration) input system is the most popular and widely used – especially by the diaspora who do not have access to a physical Bangla keyboard. Using the Avro phonetic transliteration  system they can generate Bangla words from Roman typefaces with ease. But in this era of Internet Bijoy is lagging behind. [..] So Avro came with a promise. A young man named Mehdi Hasan created Avro on his own. And he spread it across the globe via internet. Anyone can download  the software and use it (for free). The Voter ID and National ID project, the largest digital database project in Bangladesh's history, used Avro. Their first choice was Bijoy, but its proprietor company asked Taka 5000 (US$70) license fee for each computer, so they have decided to use Avro instead. In return they only had to give a certificate  to Avro. Read his post  for detailed explanations. When I started work on Bangla wiki in 2006, then I was not conversant with Bangla typing. Most of our Bangla wiki volunteers learned to type in Bangla using Avro Phonetic. 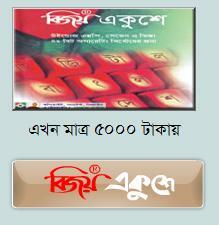 Today there are 20,000 entries in Bangla Wikipedia  and most of them were written using Avro. So Avro has a huge contribution in leaving the next generation a large collection of Bangla content in the internet. Bangladeshi netizens are showing their support towards Avro in Facebook and blogs. It is unforeseen that three Bangla blogging platforms Sachalayatan , Amar Blog  and Amra Bondhu  had changed their banner to Avro Logo to show their support in protesting Mr. Jabbar's claims. Nazrul Islam  Let language be free. I will not lease my language to any profiteer.. never. Omi Rahman Pial : We have bought our language with blood . Shame to those who wants to make profit from it. Let language be free.